Place the chicken in a slow cooker and sprinkle the Italian dressing over it. Combine cream cheese and cream of chicken soup in a small pot over low heat and pour over chicken. Cook on low for 4 hours or until chicken is done. Once the chicken is done you can take it out and shred it or cube it depending on your preference. Return chicken to slow cooker. Add milk to the sauce to get it to your preferred consistency. Serve over cooked pasta or rice. My slow cooker is on overload now that summer is here. I just can’t bare to turn on the oven and heat up the house. 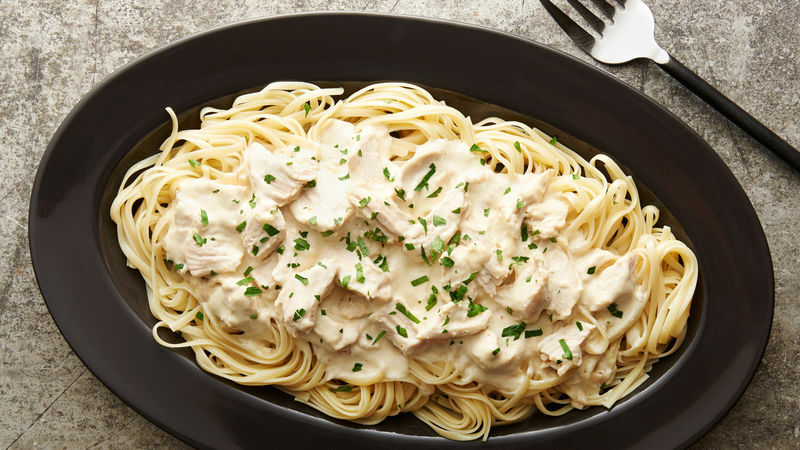 This Slow Cooker Italian Chicken is a family favorite in our house, especially with my oldest son. He requests this meal for his birthday every year. It’s a meal I know the whole family will eat without complaint, and those are hard to find. We refer to this as “Batman Pasta” in our house because we serve it over bow-tie pasta that my kids think look like Batman. This meal comes together quickly with just a few ingredients thrown into the slow cooker. It’s definitely one of those staple meals that you will frequently go back to. Dry Italian dressing is used to season the chicken and give it a zesty kick. The cream cheese sauce is great served over rice or pasta. The simple ingredients combined together smell amazing when cooking all day. Serve this with warm garlic bread and a garden salad to make this meal complete. Oh and the leftovers are great – not that you will have any! Use low fat cream cheese and fat – free cream of chicken soup to make a lighter version of this meal. The heat is on outside, so keep your cool inside by making dinner in your slow cooker. Here are a few great ideas to keep your cooker in business.